Durlston is one of the richest areas for wild flowers in the British Isles, with at least 578 species of flowering plant crammed into this tiny corner of Purbeck. An ever changing procession of flowers throughout the spring and summer means there is always something new to see. 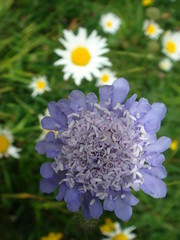 The Park is renowned for its incredible displays of wild flowers. 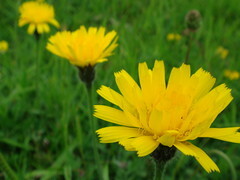 Meadows of Cowslips are followed later by wonderful spreads of Ox-eye Daisies, Rough Hawkbit and other species. The downland in early summer has lovely patches of the yellow Horseshoe Vetch and the blue Chalk Milkwort. 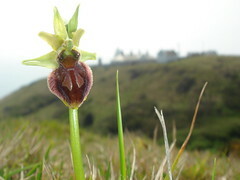 Durlston has nine species of orchid, two numbered in tens (Twayblade and Southern Marsh), six numbered in hundreds (Early Spider, Early Purple, Green Winged, Common Spotted, Bee and Autumn Lady’s Tresses) and over 12,000 Pyramidal Orchids at the last count. 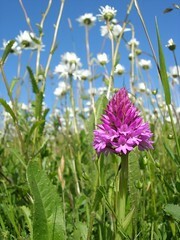 There are also 59 species of Grass, compared with around 140 in Dorset as a whole. The one Nationally Rare Species compares with 29 in Dorset as a whole, so it has around 3.5% of the county total. Its 13 Nationally Scarce Species compare with 92 in Dorset as a whole, so it has around 14% of the county total. But the Park is only around 0.05% of the area of Dorset! 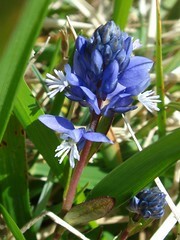 Nationally Rare Species are those found in 15 or less 10km National Grid squares in the British Isles. Nationally Scarce Species are found in 16 to 100 such squares. There are 2820 squares in total. Durlston Country Park has 413 species which are either native to Britain or anciently introduced (pre-1500AD). The British total of natives and anciently introduced species is around 1516. So Durlston has about 27% of that total, which is a very remarkable figure for such a small area. This is all the more remarkable considering that over half of the square is sea and the rest does not contain any ancient woodland, moor, mountain, river, dune, acid grassland, heath or salt-marsh. It is mostly limestone grassland, sea-cliff, scrub, and recent woodland - a limited range of habitats. 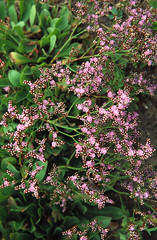 Plants of this can be seen with great care on the sea-cliff east of the lighthouse and just west of the gully. It flowers in July - its leaves are visible all year round, but are not diagnostic. There may be other less accessible sites on the cliffs. There is much more of it over 1 km to the west of the Country Park. This Sea-lavender microspecies is endemic to Dorset, occurring in the world only between Chesil Beach and this site. This subspecies occurs regularly on the sides of the gully north and north-east of the lighthouse, sometimes partly under scrub. It is at the northern edge of its range, and this is presumably the reason why it produces only a few flowering spikes in May. Its leaves, which have veins slightly paler than the rest of the leaf, appear in November; whereas those of the common species Lords and Ladies (Arum maculatum) do not begin to appear until Christmas. Italian Lords and Ladies occurs in many other sites between Durlston and St.Aldhelm’s Head, often on the east side of stone walls close to the Coast Path. A few Wild Cabbages occur on the cliff-top in the extreme south-west of the Park, where they can be viewed with care from a distance. This species is either native or an ancient introduction to Britain. There are many more along the cliff-top and in cliff quarries to the west of Durlston. They can be seen all year, but they flower in late spring and early summer. Patches of this plant occur on the top of the downland. Its five petals, which are slightly longer than its five sepals, distinguish it from its relative, Sea Mouse-ear, which usually has only four petals, the same length as its four sepals. 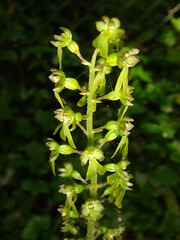 It flowers in late April and May. Sea Mouse-ear also grows on the downland, and also closer to the sea. This is the third rarest species in the Park. It is easiest to find by the level track which branches westward off the tarmac road in the north-east corner of the Lighthouse Field, in late June and July in flower, and in seed until the autumn. It needs to be distinguished from other small grasses by the enlarged glume-bases, which, when fresh and shining, look somewhat like nits in a child’s hair. 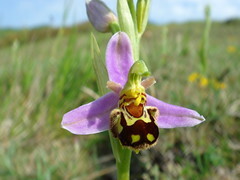 It can also be found in a small area of the south-facing slope north-north-east of the lighthouse, in a few very small patches at the bottom of the downland in the south-west of the Park, and here and there for over 100 metres on the north side of the Coast Path below the east side of the westernmost downland field. In that last site it grows in taller herbage and can attain a height of 34 cm, in contrast to its usual height of 2 to 6 cm elsewhere. This delightful little plant varies considerably in numbers year by year. It is endemic to England. It can most easily be found in late April and May on the eastern side of the Lighthouse Field on the ridge which runs down the slope between the two tall metal mile markers. Another regular site is north of a shallow quarry in the north-east of the southern half of Saxon Field. It also occurs on the downland. There is plenty of this member of the Daisy Family at the bottom of the gully by the sea. It also grows near the south-facing cliff-tops in other places. It flowers in July and August, but plants can be found all year round. Golden Samphire is not edible, but nor is it poisonous, unlike the unrelated edible umbellifer Rock Samphire, which likes the same habitat, and the various Glasswort species of salt-marshes, which are also called Marsh Samphires, which are not found in the Park. This occurs around a number of the meadows. Outside the Park there are few sites in Purbeck. June is the best month. This grows, sometimes intertwined with its common relative Spotted Medick, in the “lawn” at The Lookout café. Toothed Medick has paler yellow flowers and looser spiral seed-pods. This, the second rarest species in the Park, is the species that people travel miles to see It flowers from April to early May. Durlston’s downland and meadows and the rough slopes to their west hold one of the largest British populations. Just a few spikes of this parasite on Wild Carrot may be found in late May and early June by the Coast Path near the lighthouse; sometimes there is only one. Common broomrape (var. minor) occurs in some of the meadows; it lacks the yellow humps inside the flowers which distinguish Carrot Broomrape. 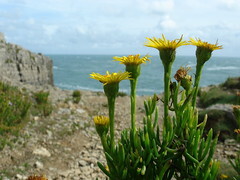 A few plants can be found with difficulty by the lowest steps of the Coast Path on the east side of the gully, in late June and early July. Rather more are out of public gaze on the floor of Tilly Whim quarry. The species occurs in larger quantity on other accessible quarry floors to the west of the Park. This shows its pretty star-shaped flowers in a few places on the Park’s south-facing downland slopes, as it also does on slopes to the west of the park. It is seen more often by accident than through deliberate searching. It flowers from June to early autumn. 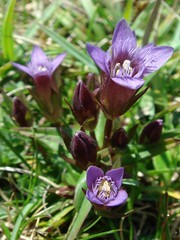 A few plants of this species can usually be found in June in the meadows. It is most easily told from the other two Tares by having five or six seeds in its pods: the other species have less. Join one of our many guided walks. A regularly updated plant list is available for purchase in the Visitor Centre. The Rangers are happy to provide information on what to see and where to find it - just pop in.